This High Temperature IR Oven is 20 feet long and has no conveyor. It can produce temperatures up to 1000 degrees Fahrenheit. It was used to cure silicone This IR oven was designed and fabricated to cure waterborne adhesive on flocked paint pads. The energy had to penetrate a long white fiber and to cure the adhesive on a soft foam rubber sheet. 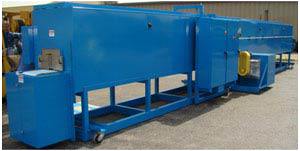 This IR oven was designed and fabricated to cure a flocking adhesive applied to a thermoplastic product whereby the appropriate heat had to be applied to cure the adhesive and excess heat could not be applied so as to distort the plastic. 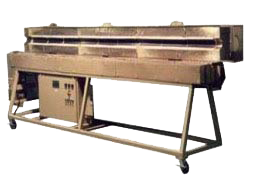 Infrared/Hot Air Curing Oven for Rubber products. Front & Rear views of the oven. 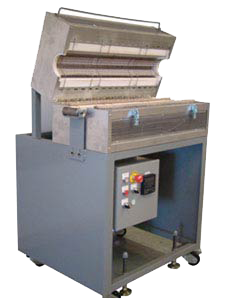 High Velocity Hot Air Curing System for rubber extrusions. 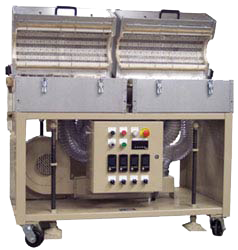 EIS builds a variety of pre-heaters. These are used to preheat steel, fabric, wire or other materials that may be cross-headed at the extruder. 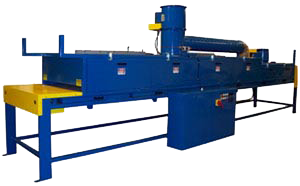 Preheating these materials allows the rubber or plastic to adhere better to the material. 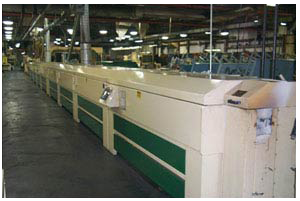 Pre-heaters are also effective at taking moisture out of cloth or woven products prior to cross-heading. This reduces blisters in the rubber. 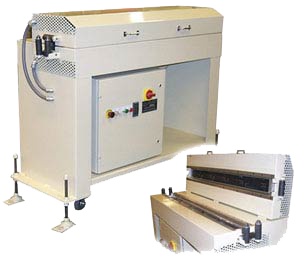 Pre-heaters can also be used to dry adhesive, coatings, achieve some skin cure prior to laying a product on a belt so that it does not get belt marks. 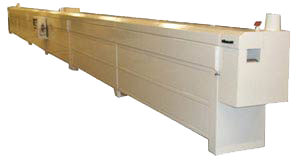 Depending on the application the length and KW are determined to provide the best solution.